5 TBS Capizzano’s Basil Infused Olive Oil add enough for it to coat all ingredients about 4 – 5 TBS. 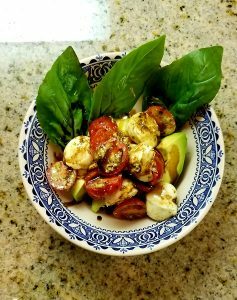 Capizzano’s Private Reserve Traditional Balsamic Vinegar drizzle on top before serving. basil leaves snipe enough as a garnish on top. Put shelled and pitted avocado half in a shallow bowl. 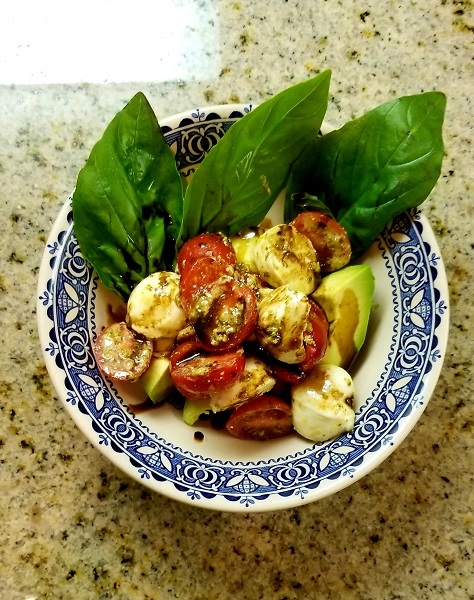 Put tomatoes, mozzarella, Basil Olive Oil and pesto in a bowl, fold together until thoroughly coated. Add mixture of tomatoes, mozzarella, pesto and Basil Olive Oil on top of avocado. Drizzle the Traditional Aged Balsamic Vinegar on top. Garnish with fresh snipped basil leaves. Enjoy.